A quick congratulations to two pals of mine who have new books out this month. The first to hit the shelves is Langdon Cook’s The Mushroom Hunters: On The Trail of an Underground America. Filled with outlaw fungi hunting, mouth-watering meals, food fanatics, and some damn good writing, Lang’s book is a tale deep into the heart of the thriving subculture of mushroom hunting. After you read Mushroom Hunters, you will never look at a mushroom quite the same way again. 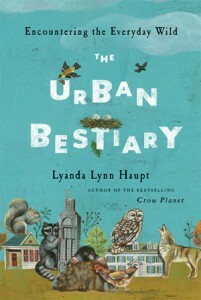 Just out this week is Lyanda Lynn Haupt’s The Urban Bestiary: Encountering the Everyday Wild. As she did in her award-winning Crow Planet, Lyanda reveals that even in the urban environment, nature is all around us if we take the time to slow down and observe. With her lyrical and passionate observations, Lyanda opens a wonderful world to the lives that we share the urban wilds with. After you read Urban Bestiary, you will never look at your yard the same way again. Look for their books in local bookstores everywhere. Congrats to both.